For SrIvaishNavas, the following points are very useful to understand and practice in their lives on a day-to-day basis. Respect SrIvaishNavas irrespective of their varNam, ASramam, gyAnam, etc. Respect towards fellow bhAgavathas is bhagavAn’s first expectation from his devotees. Lead a simple life devoid of ego and possessiveness. Once we realize the miniscule nature of the AthmA (self) and the grandeur nature of bhagavAn, we can never think great about ourselves. Regular interaction with one’s own AchArya is a very important aspect. It is important and mandated for the Sishya to help his AchArya in physical, financial needs as much as possible. 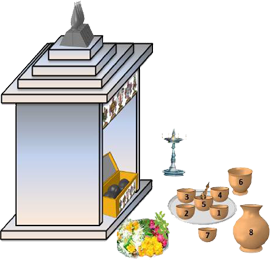 Perform nithya karmAnushtAnams such as snAnam, Urdhva puNdra dhAraNam, sandhyAvandhanam etc., according to one’s own varNam and ASramam. Through performance of such ordained activities, one develops internal and external purity which will lead to sustenance and nurturing of true knowledge. Always wear thirumaN and SrIchUrNam (thilak) - this is our primary identity of our servitorship towards bhagavAn. It is most important to wear it boldly at all circumstances and never feel ashamed of it. Wear traditional clothes panchakachcham, madisAr etc., as per one’s gender, varNam, ASramam. There is nothing to feel shy about being who we are and what our culture is – especially coming in the great lineage of AchAryas. Always engage in worshiping SrIman nArAyaNan, AzhwArs and AchAryas. On the contrary avoid worshiping dhEvathAntharams (dhEvi dhEvathAs - dhEvathAs such as rudhra parivAr, indhra, varuNa, agni, navagrahams, etc). This is one of the most important principles highlighted by our pUrvAchAryas. One of the main relationships between bhagavAn and jIvAthmA is bharthru-bhAryA (husband-wife) relationship. Since all jIvAthmAs are feminine in nature and bhagavAn is the singular masculine entity, all jIvAthmAs have this common relationship with bhagavAn. So, it is imperative for one to manifest faithfulness towards bhagavAn at all times and avoid any relationships with dhEvathAntharams. thiruvArAdhanam at home is an important aspect in a SrIvaishNava's daily routine. emperumAn has mercifully descended into our own homes to accept our worship. It is a great insult to ignore him and will be very detrimental for ones own spiritual progress to ignore perumAL at home. Even while we are travelling, it is best to carry the thiruvArAdhana perumAL also with us. If that is not possible, at least adequate arrangements should be made to ensure proper thiruvArAdhanam for him either at our own home by SrIvaishNavas or by placing him in other SrIvaishNavas' homes. It is completely disrespectful to leave him locked in the home without daily thiruvArAdhanam. There is a detailed discussion on thiruvArAdhanam at http://ponnadi.blogspot.in/2012/07/srivaishnava-thiruvaaraadhanam.html. Always consume those food materials that are allowed in SAsthram based on one’s own varNam and ASramam. Such food stuff should first be offered to emperumAn, AzhwArs and AchAryas and then only be consumed. We should never consume such foods that are not offered to emperumAn. There is a detailed discussion on AhAra niyamam at http://ponnadi.blogspot.in/2012/07/srivaishnava-aahaara-niyamam_28.html and http://ponnadi.blogspot.in/2012/08/srivaishnava-ahara-niyamam-q-a.html. Seek out the association of SrIvaishNavas. It is important to engage with meaningful spiritual conversations that will uplift us and help us in our spiritual progress. dhivya dhEsams, AzhwAr/AchArya avathAra sthalams and abhimAna sthalams are important parts of our life. One should lead a life of service in dhivya dhEsams and so on. If the circumstances are not right presently to be engaged in such service, try to visit such holy places frequently and also plan for such setup in the future. dhivya prabandham is the most important aspect for SrIvaishNavas. Learning the pAsurams, understanding the meanings of the same (according to pUrvAchAryas' explanations) and putting those principles in to practice are the 3 most important aspects which define a SrIvaishNava. dhivya prabandham develops detachment towards worldly matters and attachment towards bhagavAn and bhAgvathAs. The lives of our pUrvAchAryas are by themselves the greatest source of learning and inspiration for us. They have demonstrated utmost dignity and compassion towards all beings and all the situations/dilemmas that we come across today are addressed clearly in their lives. Study of pUrvAchArya literature is most important. One should allocate some time on a daily basis to plunge into the greatest available treasure, i.e., pUrvAchArya literature in the form of vEdhAntham, dhivya prabandham, sthOthra granthams, vyAkyAnams, historical depictions, etc. There is plenty of such information available in our websites (http://koyil.org/index.php/portal/) for reading. Listening to kAlakshEpams (lectures of commentaries with source text) under scholars is most important to get thorough understanding of the essential principles. Nowadays, there are many lectures available in CDs and websites. For those who cannot attend these lectures personally, they can make use of such resources that are available. Even while listening from home, one should try to be in proper attire and listen to these lectures with attention as it would be done in physical presence. Engage in some meaningful kainkaryam. SAsthram says “servitorship becomes devoid when there is no service” – as a servitor of SrIman nArAyaNan, AzhwArs and AchAryas, one should always engage in some service. It can be physical, monetary, intellectual etc. There are so many ways to engage in service. There is also so much demand for those who are interested in kainkaryam. One should always commit to some service which is recurring and fulfill that too. This way, there is constant engagement with bhagavAn and bhAgavathas. Help fellow bhAgavathas and others in acquiring this most wonderful knowledge about bhagavAn, AzhwArs and AchAryas. Constant engagement in sharing such knowledge is mutually beneficial and enjoyable for both the speaker and listener. Our pUrvAchAryas have set a wonderful precedent by sharing many divine literature for the sole purpose of uplifting everyone through true knowledge. It is the duty of all of us to also study them carefully under proper guidance and then share the same with our family, relatives, friends and all those who desire for such knowledge. Finally, one should constantly long for the eternal blissful life in parama padham which is fully fitting for the true nature of the soul. A real SrIvaishNava would never fear death for that which leads to the eternal service to bhagavAn in the most magnificient SrIvaikuNtam. Our AzhwArs and AchAryas always served bhagavAn and bhAgavathas when present here and desired to continue the same after reaching parama padham also.